Registration: Opens Monday, January 21, 2019. Deadline is Monday, June 17, 2019. Walk-ins are welcome after that at the site. Registration fee is $20 per person and class fees are paid to the Instructor at class time. Walk-In Registration is $25 per person. Classes fill up early. Register by May 1st, 2019 to be eligible for daily drawings. You will be able to order t-shirts and sweatshirts online with a deadline of June 17, 2019. Check-In Desk: 7:30am-8:30am daily, beginning Saturday, July 13th. Pick up your name tags, which are required for class, banquet tickets, and t-shirts/sweatshirts at the desk. Friday 12th: At 9am in the Main Room, early arrival carvers, instructors, and vendors help set up tables and chairs; after which vendors and instructors can set up their areas. See Bill Bang, David Sharp, Jack Erickson, or Alan Clark to help with setup. The check-in desk will open at 1pm. Saturday 13th-Friday 19th: Main building is open for coffee and pastries from 7:30 am-8:30 am for $2-$6. Lunch is served from 11:30 am-1 pm for $4-$8. Classes are in session from 8:30 am-11:30 am and 12:30 pm-3:30 pm. Your help cleaning up after each class is appreciated. Sunday 14th: Instructor Meeting at 4 pm in the Main Room. Monday 15th: You may want to attend a performance at the Creede Repertory Theater. Tuesday 16th: Business meeting at 4 pm in the Main Room. All students are encouraged to come and share ideas. Wednesday 17th: Pre-registration for July 2020 classes at 7:30am in the Main Room. Auction setup at 4 pm. Please help. Annual Auction at 6:30 pm in the Main Room. Donated items help support our event. Everyone please help fold chairs and place against walls after the auction. Thursday 18th: Banquet setup at 4 pm. Please help. Banquet at 6:30 pm in the Main Room. Cost is $20 per person. Order banquet tickets with your registration or purchase them by Tuesday, July 16th. Door prize drawings follow the meal. Friday 19th: Classes end at 3:30 pm. Please help your instructor fold up chairs and tables and put them away. Have a safe drive home. Vendor table space: Contact Diana Smith at dianasplace@outlook.com for table availability. The cost is $30.00 per table for the week. Items for sale need to be related to wood working or classes taught at CWRC. Please insure you have someone at your table during event hours. 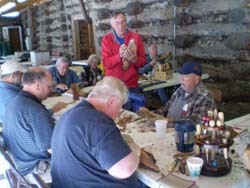 Non-carving activities: Non-carving classes on site (register for them online, through the mail or when you arrive). Or consider shopping in Creede’s unique stores, go sight-seeing, go fishing, take in a church bazaar, or productions at the Creede Repertory Theater. Auction and drawings: Thanks to your generous donations, the auction and drawings raise enough money to run the Rendezvous and help the community. Come to the auction to bid on some spectacular carvings and works of art from artisans from around the country. 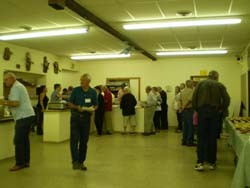 VOLUNTEERS NEEDED: We sincerely appreciate all those who have given their time in the past to keep the Rendezvous going. Please sign up to volunteer at the Check-in desk. This helps the board members keep the event running and enjoyable for years to come. 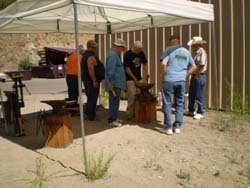 CWRC is put on by carvers for carvers. Classes for beginners through advanced craftsmen.